The earthquake that scared the living daylights out of the East Coast last week, has federal inspectors headed to Virginia’s North Anna nuclear power station after early data indicated the plant may have experienced more shaking than it was designed to withstand. The Nuclear Regulatory Commission (NRC) sent additional inspectors to the site, about a dozen miles from the quake’s epicenter near Mineral, VA. The added scrutiny came from preliminary data reported Friday by the plant’s operator, Dominion Virginia Power, which signaled that ground motion caused by the 5.8 magnitude quake surpassed the plant’s design. A more detailed seismic analysis should be complete by the end of the week, said Jim Norvelle, a spokesman for Dominion. The plant remains offline. 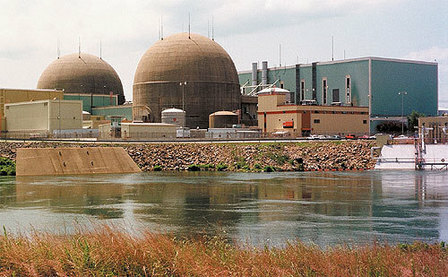 They cannot restart the plant until its operator can show the NRC it remains safe. Dominion and NRC inspectors are conducting an inspection of the safety systems and physical structures of the plant. So far they have found no indication of significant damage, but there are signs of the quake: Thermal insulation that shook off pipes within the nuclear containment units, cracks in ceramic insulators on the plant’s transformers and fallen ceiling tiles at a commercial office building just outside the fence that surrounds the power station, Norvelle said. Virginia's North Anna nuclear power station will under go more testing after the earthquake.